Philippine Tour in a Skylab Hammer and Spider Cab Shown by Nat. Geo. 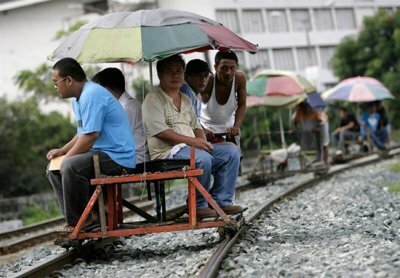 A popular TV show that airs on the National Geographic and BBC channels is featuring the country’s unusual methods of transportation. Entitled "By Any Means," the travel documentary presents host Charley Boorman and his cameraman Paul "Mungo" Mungeam, as they take a Philippine tour and go around using rare transport vehicles. Hosting the crew and providing information on the country’s interesting modes of transport, the Department of Tourism (DOT) accompanied Boorman and Mungeam in their journey which includes sidetrips to alternative tourist spots. "Apart from presenting accessibility of our different destinations through our creative means of transportation, the show also highlights the unique facets of our tucked-away destinations," said Tourism Secretary Ace Durano. "We made certain that the group will have a one-of-a-kind feature during a Philippine tour. We had them visit interesting locales such as a monastery in Bukidnon, a fishing farm in Camiguin and a pineapple farm in MalayBalay," said Undersecretary Eduardo Jarque. Jr.
"By Any Means" planned a 10-day trip starting from Davao to Manila. They rode a skylab from Davao to MalayBalay where they transferred to a fruit truck to reach Cagayan De Oro. From there they took the Supercat boat to Camiguin, then hopped on to a navy boat to Bohol. Going to Cebu, they caught another SuperCat. The crew then hitched a ride on a military chopper that took them to Ormoc. Then they commuted via a public bus to Tacloban where they visited the Leyte Landing. From Palo, they took a Jega spider cab to Basey. A fish truck brought them from Calbayog to Allen, Samar where they boarded a Ro-Ro ferry to Sorsogon. Traveling to Legazpi, the crew rode a rescue ambulance and then scooters to Camsur until they reached Quezon province. From Calauag town, they took a railroad trolley all the way to Lopez where they got on an "anahaw" delivery truck to get to Unisan. Following on the Philippine tour the group rode a hammer to reach Las Pinas then jeepney to Makati and finally a quick tour of Manila on Mad Dog bikes. According to Jarque, among the vehicles, the most unheard of during their Philippine tour were skylab, spider cab, railroad trolley and hammer. A skylab is a motorcycle that’s been modified to accommodate more than two passengers with the use of long wooden planks.